On Human Compassion: Encountering The Dalai Lama's Scientific Mind : 13.7: Cosmos And Culture In a speech at the College of William and Mary, the Dalai Lama described the unique nature of human compassion versus that of other animals. What matters as much as his conclusions, says commentator Barbara J. King, is the spiritual leader's beautifully scientific stance towards life. Yesterday I sat in the presence of a spiritual leader and felt the power of a mind that practices contemplative Buddhism and embraces modern science. 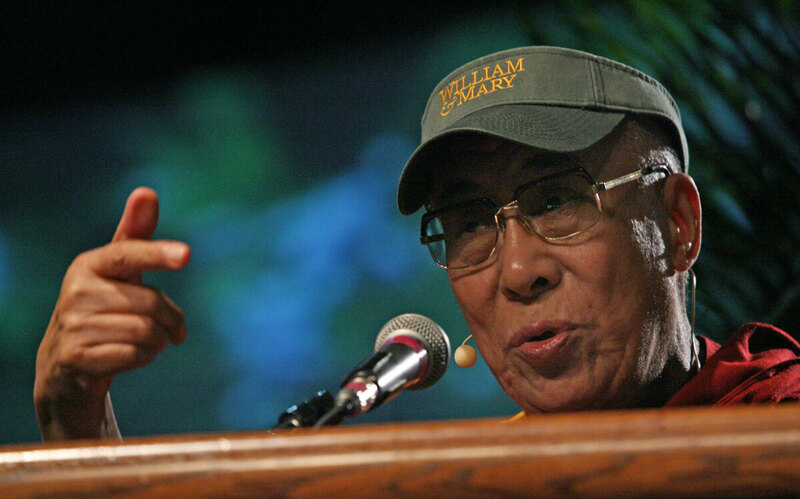 His Holiness the 14th Dalai Lama, Buddhist monk and winner of the Nobel Peace Prize, spoke Wednesday to a crowd of 8,000 students, faculty, staff and members of the community at an arena at the College of William and Mary in Williamsburg, Virginia. His central message, about the transformational strength of human compassion, was straightforward yet profound. All mammals, the Dalai Lama asserted, practice a basic compassion that stems from the mother-infant bond. We humans thus have, by nature, a sense of love and affection. However, human compassion is markedly different because it "can extend infinitely," even to strangers and to our enemies. With our intelligence, we can do what no other species can: distinguish between the action and the actor. We can reject what our enemies do while still recognizing those people as human like we are, and thus fundamentally the same as we are. In this way the Dalai Lama moved fluidly between what I'd call a continuum model of compassion, one in which our brand of loving kindness emerges from that of other mammals, and a dichotomy model, which stresses that our species' compassion is like no other animal's. But is this accurate? Is there a sharp division such that other animals never express compassion for strangers or enemies? I'm not entirely sure. When Frans de Waal discusses empathy, he likes to tell the story of the captive bonobo Kuni who came to the aid of a wounded bird. And in the wild, elephants may try to help an ailing or dead elephant, even when that animal is a stranger. Here's the joyful thing, though — the stance the Dalai Lama takes toward the knowledge he asserts is a scientific one. If evidence accumulates to seriously challenge the "human only" or dichotomy model of compassion, the Dalai Lama would, I feel sure, be first in line to leave behind the old perspective and embrace the new one. "On the philosophical level, both Buddhism and modern science share a deep suspicion of any notion of absolutes, whether conceptualized as a transcendent being, as an eternal, unchanging principle such as soul, or as a fundamental substratum of reality. ... In the Buddhist investigation of reality, at least in principle, empirical evidence should triumph over scriptural authority, no matter how deeply venerated a scripture may be." And in yesterday's talk, he urged all of us to investigate, to experiment, and to question continuously, in any realm of life. In the end, I suspect it's right that human compassion may be expansive, compared to that practiced by other species. Of course, our compassion fails miserably all too often — we know this from a single day's newspaper or newscast. "If we go to the fundamental level, we are the same human being. ... Seven billion human beings are the same human being." What's amazing about being in the presence of the Dalai Lama is this: He reaches out to 8,000 people (watch the talk here) and makes you feel his calm mind, his open heart toward all people and his joy in infinite questioning, scientific questioning, about life's fundamental truths.